This simple, yet elegant salad is paired with a poppy seed dressing. Feta cheese, strawberries and pecans, never tasted so good. Cook bacon until crisp, let cool and crumble, then set aside. In a mini food processor or blender, combine olive oil, red wine vinegar, sugar, Dijon mustard and poppy seeds. Pulse for a few seconds. Place spinach in a salad bowl. Top with crumbled bacon, strawberries, pecans and feta cheese. Serve with dressing. That's an awesome combination, I always liked adding fruits to my salad, especially the sweet/sour ones since it adds a kick to the usual greens. Thanks for the recipe, I'm very curious about the dressing! You had me at Spinach. I just love Spinach. It's really really good. omg this looks yummy willtry this for a different salad this week! Looks awesome except for the feta cheese. I just can't wrap my mind around that stuff. Love the pecans in it though! I’ve never thought strawberries, feta cheese, bacon and pecan go so well together! The photo looks so yummy! Thanks for such an amazing recipe! I’d love to try it! 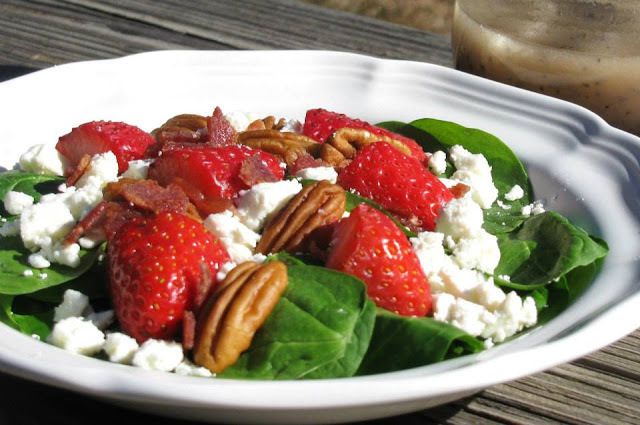 Spinach, strawberries and walnuts are one of my favorite combinations in a salad! The strawberries make it so refreshing and the walnuts add a nice crunch! This is another delish salad to try to make. I LOVE the strawberry but I will pass the pecan as my daughter has peanut allergy. Soooo good! I can't wait to try your recipe! Strawberries and spinach sounds great! Looks so good and yummy! I would love to try this to make. My husband and son will love this. Looks really delicious. SO yummy indeed. 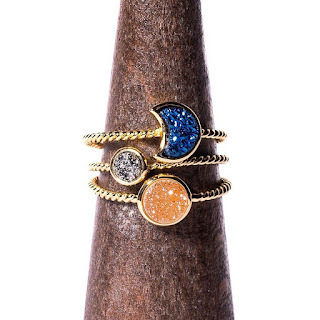 I want it right now! This is our favourite salad! We also add a little arugula and some walnuts to the mix. Like Heather, I struggle with feta, but I'm rare. Most people love it. Besides that, this is a fresh and delicious salad and I want to try it. This looks so yummy. I want to make it tonight! Terrific combination of sweet and savory. This looks so very healthy and yum! That sounds like a wonderful salad! I could go for one of those right now! I've had this before but not with the feta cheese. That makes a great addition. Yum! YUM!! this looks delicious and I so want one. This sounds SO good! I am a huge fan of strawberries in a salad. This salad is just like one I make in the summer. I want to try your version! What a delicious salad. The nuts and feta cheese take it to a whole new level! I love strawberries with fresh greens. I am marking this one down for a light and filling dinner next week. That's my kind of salad right there. It photos up pretty too! It looks sooo good! Strawberry and spinach, yummy! I can't wait to make it! This sounds like a nice twist on a salad. Spinach is so good for you and a better option than some lettuces. You had me with the title! I use spinach for salad instead of lettuce so this was right up my alley. Thats a vibrant salad! I love the strawberries in it! That looks absolutely delicious! I love fruit and nuts on salad....and the dressing sounds so good.